The Flight Head Mini 3 is a new generation of stabilized camera remote systems which eliminates adverse motion artifacts from pan, roll, tilt. It is one of the lightest and most compact stabilized heads on the market. Due to its light weight carbon fiber design and stabilization performance you can achieve unusual shooting angles ensuring very stable and smooth images. It can be used on any type or size of camera crane, dolly, portable handheld booms, cablecam rigs. Wireless capable. Flight Head Mini 3 offers recorded moves, shake generator, horizon shift, limits on all axis, automatic drift compensation, etc. arm on a vest, or mounted on vehicles such as Segways, quads, cars, vans or even boats. The Portocam crane is easy to set up, lightweight and can be easily transported to remote locations via backpack. Its compact design allows the set up to work in tight and narrow places, (difficult) locations, and from various small vehicles. 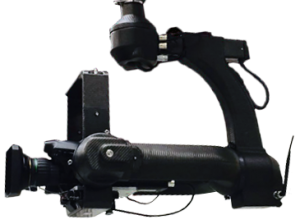 Portocam can be operated either by one cameraman with an on-board joystick or by two persons where a Portocam operator moves the crane and an operator controls the Flighthead Mini via wireless link.